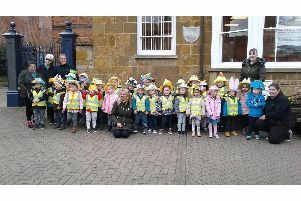 The first year for Harborough’s transformed library, museum and adult learning venture has been hailed as a success story. One year on from a £5.75m transformation of a former corset factory in Adam and Eve Street, figures show that around 200,000 visits were made to The Symington Building, which also houses Harborough District Council’s offices. Richard Blunt, Leicestershire County Council’s cabinet member for museums, believes the success of The Symington Building is a testament to the partnership work involving the county council, district council and Harborough Historical Society. The re-development of the first floor of The Symington Building started in February 2013 and the work has included a painstaking re-installation of the museum’s collections including the Hallaton Treasure and a temporary space to attract national touring exhibitions. The funding for the new museum, library and adult learning space has come from the county and district council, as well as a generous contribution from the Market Harborough and The Bowdens Charity. Further information on the museum and library is available at www.leics.gov.uk/symington.